I spotted this recipe first in last year’s Thanksgiving Issue of Bon Appetit. Then, I found it again online this year and made it for Thanksgiving. Though it’s a great holiday side dish, I’d take it any ol’ evening as a main dish. 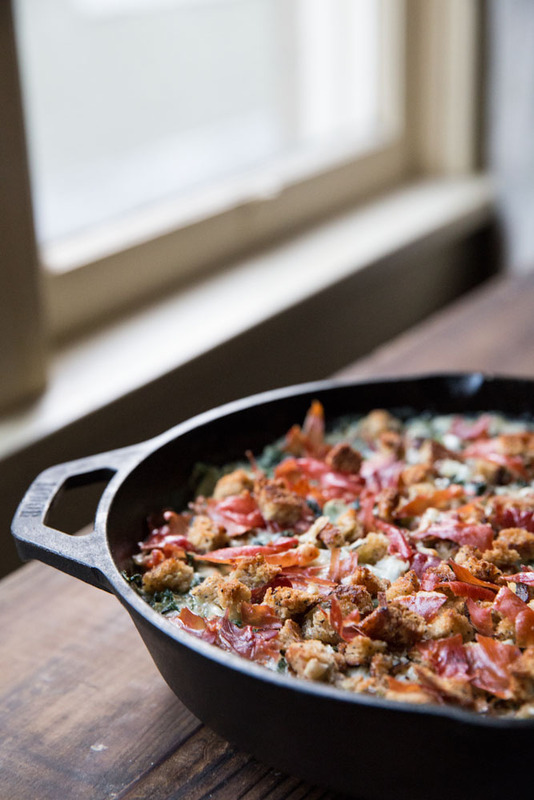 The crispy prosciutto on top of the creamy greens and crispy bread makes for a hearty and satisfying dish! And, if you have more winter greens around your house than you can possibly consume, this is a great way to use up those seasonal leafy friends. The original recipe calls for all collard greens but I use a mixture of collards and kale. 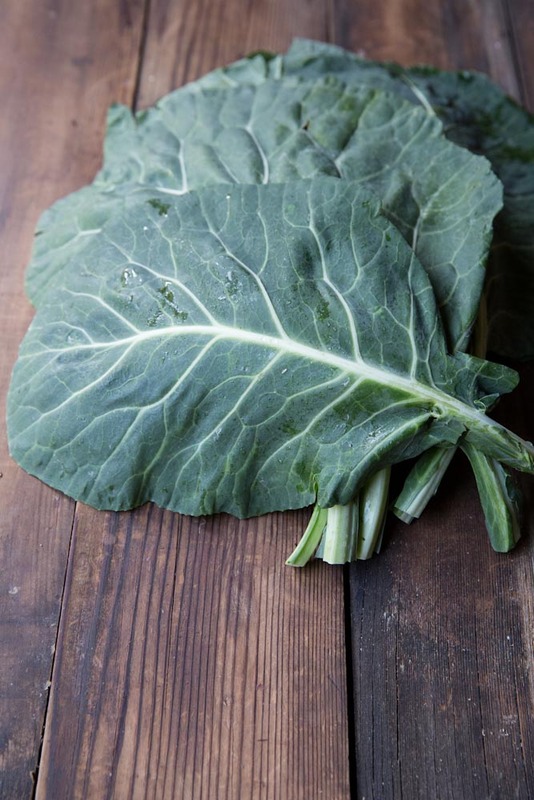 If you’ve never bought collard greens, the picture above is of the collards (so you know what to look for). Collards are all the rage lately, being used for wraps instead of bread. They aren’t only for Southern style sautés anymore! 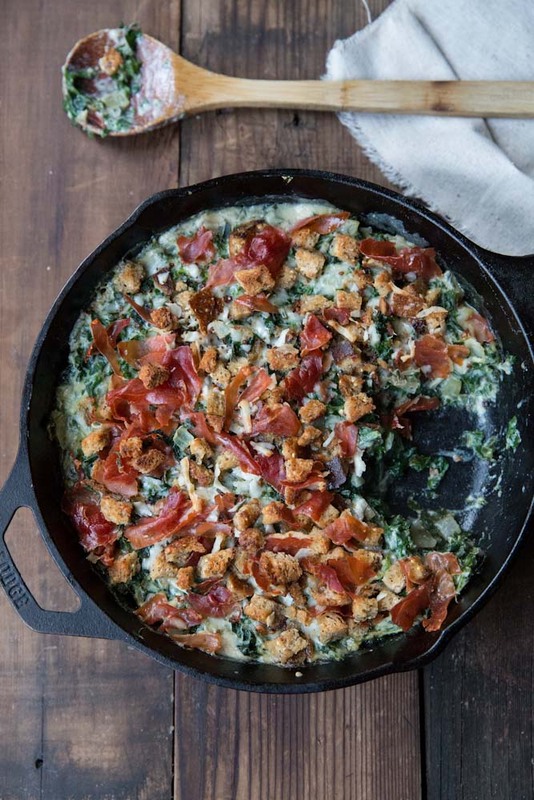 This Kale and Collard Green Gratin is great for any winter pot luck or holiday table. Cook collard greens and kale in a large pot of boiling salted water until tender and bright green, about 3-4 minutes. Drain, transfer to a bowl of ice water, and let cool. Drain again and squeeze dry with paper towels. Coarsely chop greens..
Heat remaining 2 Tbsp. oil in a medium saucepan over medium heat. Add onion and garlic and cook, stirring often, until softened and golden, 5-10 minutes. Transfer to bowl with greens; set aside. Reserve saucepan. Increase oven temperature to 400°. Melt butter in reserved saucepan over medium heat. Add flour and cook, whisking constantly, until mixture is smooth and very pale brown, about 4 minutes. Gradually whisk in milk, ½-cupful at a time; add nutmeg. Bring to a boil, reduce heat, and simmer, whisking often, until thickened, 5–8 minutes. Whisk in remaining ¾ cup Parmesan. Add this béchamel sauce to collard green, kale and onion mixture and mix to combine; season with salt and pepper. Transfer collard green mixture to a 10” cast-iron skillet or 9” pie dish and top with breadcrumb mixture. Tear the proscuitto and roll or lay flat over the bread crumbs. Bake until gratin is bubbling, 15–20 minutes. Let cool slightly before serving. You may use all collard greens or all kale depending on availability or preference. 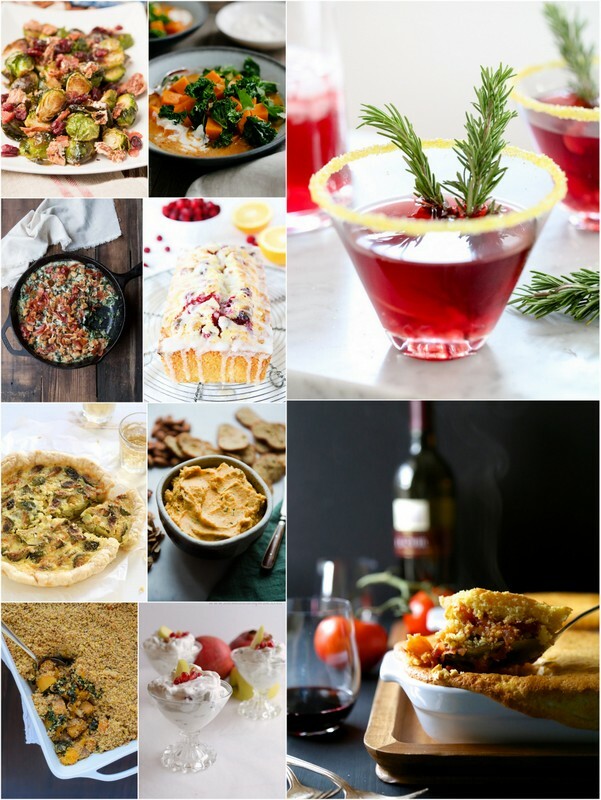 One last note for the day: I’m teaming up with Cooking with Ruthie for a local giveaway. After being a part of a recent car accident and coming out with only minor bumps and bruises she wanted to team up with Toyota to give back this holiday season. I’m helping spread the word about her generous giveaway. Our Spreading Holiday Cheer Giveaway with Karl Malone Toyota! A group of Utah Bloggers and Karl Malone Toyota have come together to bring a little extra Holiday Cheer to 7 lucky families. Karl Malone Toyota are group of wonderful people who genuinely care about you and your families~ they’ve sponsored this event and we’re just so thrilled to bring it to you! *This promotion is sponsored by the above specified bloggers and Karl Malone Toyota. The giveaway will run from Monday, December 8, 2014 at 12:01 AM MDT and ends Friday, December 19, 2014 at midnight MDT. Once the giveaway ends, winners will be chosen using Rafflecopter.com and contacted via e-mail within 24 hours. Winners will then have 48 hours to claim their prize or another winner will be chosen. This giveaway is open to Utah, Idaho, and Nevada residence only except where prohibited by law. Winners must be of full legal age in the jurisdiction in which they live. This group of bloggers and Karl Malone Toyota are only responsible for sending out the prizes. They are not responsible for loss, damage or theft once the prize is shipped. Participants will be responsible for any taxes, tariffs duties, etc. due upon delivery of the prize. Looks absolutely wonderful, Becky! Definitely a great winter dinner! Thanks Liz, Hope you and your family had a nice Thanksgiving! Haaaha!! I agree! It’s way better than any collard greens I’ve had! Don’t mind me, I am just going to take the whole skillet! Looking delish my friend!! Thanks Lauren. I may just have to make this for my main meal again soon! 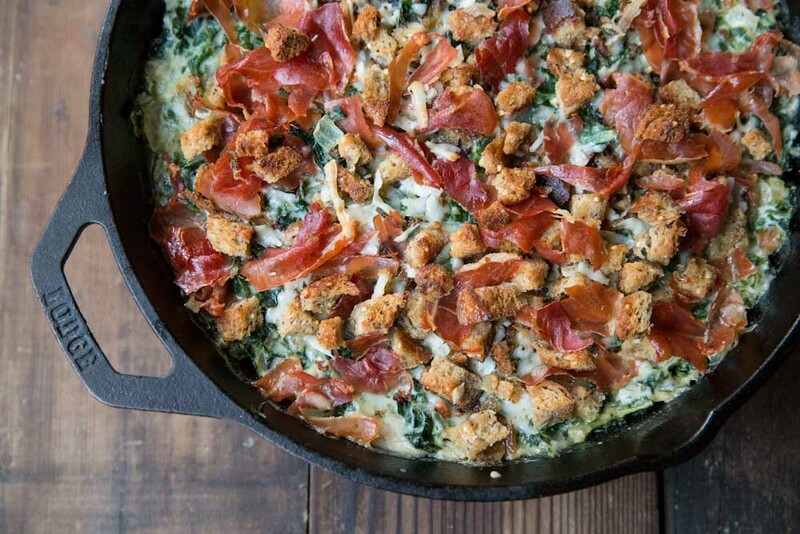 Becky, all my favorites are in this skillet – and how can anyone resist prosciutto on top? ?